Hume Springs Park Design Workshop TODAY! The Department of Recreation, Parks and Cultural Activities is hosting a public design workshop for the Hume Springs Neighborhood Park Plan this afternoon (Saturday, December 13) at 1 p.m. at the Cora Kelly Recreation Center, 25 West Reed Ave. The workshop will include a review of feedback received from the Hume Springs Park survey and a park design charrette. Hume Springs Park is one of 17 existing neighborhood parks currently being planned for through the park planning process. The results of this plan will help determine budgeting priorities and recommendations for both short and long-term incremental improvements, ensuring that neighborhood parks serve Alexandria’s needs now and into the future. For additional information, visit the Neighborhood Park Planning website. In conjunction with the park planning process, RunningBrooke of Alexandria is partnering with the City to help fund improvements to Hume Springs Park and playground. This workshop will assist in developing the scope of work for their contribution. Park improvements anticipated to be under construction in Summer-Fall 2015. 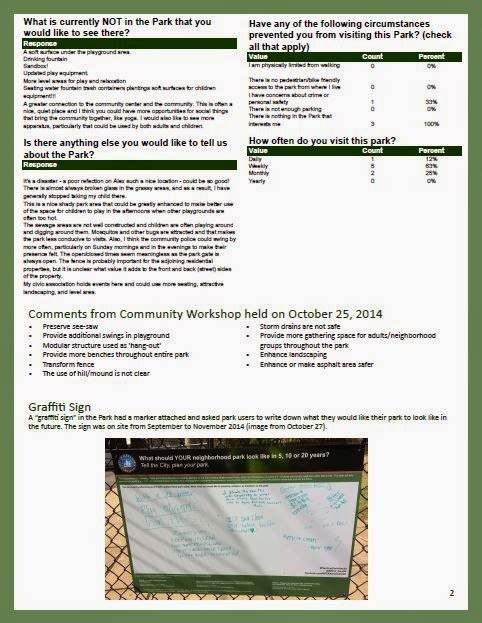 Through your feedback Park staff hope to make informed budgetary and park use decisions so that Hume Springs Park can be even greater asset to the community. For additional information about Hume Springs Park contact Judy Lo, Landscape Architect, at703.746.5490 or judy.lo@alexandriava.gov. The City of Alexandria is committed to compliance with the Americans with Disabilities Act. To request a reasonable accommodation or to request materials in an alternative format, contact Judy Lo at703.746.5490 (Virginia Relay 711) or judy.lo@alexandriava.gov. Community feedback compiled from a variety of sources (page 2 of 2). 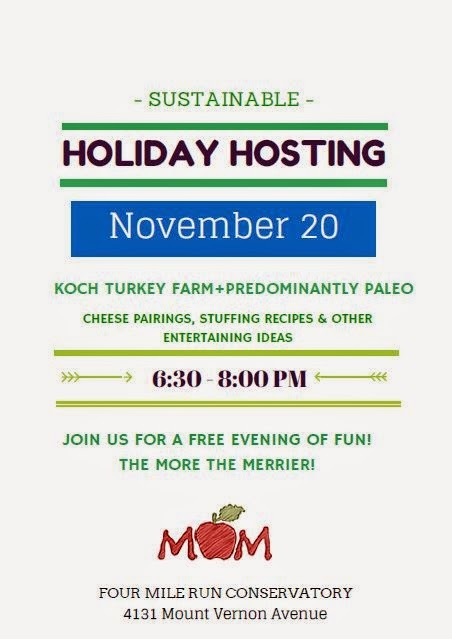 Sustainable Holiday Hosting presented by MOM's Organic Market, THURSDAY!! MOM's Organic Market is excited to hosting their first Sustainable Holiday Hosting community outreach event this Thursday evening (November 20th) from 6:30-8:00pm at the Four Mile Run Conservatory Center (4109 Mt Vernon Avenue). MOM's staff will be demonstrating and tasting some of their favorite holiday foods and meal suggestions, from gluten free stuffing to organic pies with healthy toppings. They'll also be sharing information about ways to keep the holidays more sustainable. Everything is free of charge and MOM's plan to make sure the time is fun for the whole family. 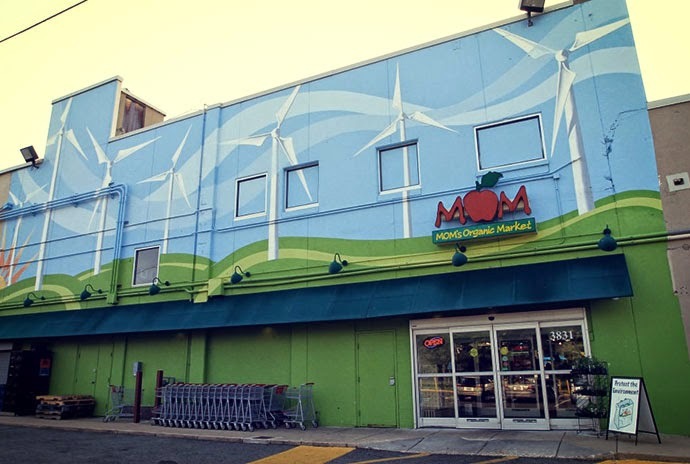 MOM's Organic Market opened is Arlandria location in October 2002 at 3831 Mount Vernon Avenue and does business 7 days a week from 9am-9pm (Except Sundays: 9am-8pm). We believe that environmental destruction and climate change are the biggest problems facing humankind today. We believe that in leading by example we can protect and restore the environment. By instituting best practices to reduce our impact on the environment, and by educating staff and customers, we are influencing customers, employees, and many other businesses. MOM's has been a strong supporter of environmental efforts throughout the region and right in their own backyard in Arlandria's Four Mile Run Park (see links below). With the news is out that the Mount Vernon Village Center redevelopment is going forward (Arlandria Redevelopment Project Could Get Rolling in 2014), MOM's will continue to serve Arlandria in new and better ways. According to the a spokesman for the development, "MOM's is getting bigger"...more space in the new building next to their current location. An Arlandria Action Plan Advisory Group Meeting will take place tonight, 7-9pm at the Cora Kelly Recreation Center, 25 West Reed Avenue. Please join your neighbors in learning about recent efforts to implement the Arlandria Neighborhood Plans. Discussion topics include Four Mile Run Park, Four Mile Run Stream Restoration, pedestrian and transportation improvements, and private development projects. Please note that simultaneous translation will not be provided at tonight’s meeting. 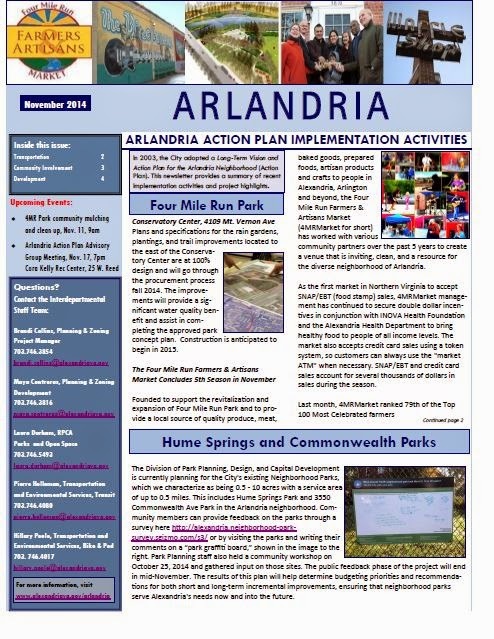 For additional information or to get involved, please visit the Arlandria Plan Implementation website at www.alexandriava.gov/arlandria or contact Brandi Collins at 703.746.3854 or brandi.collins@alexandriava.gov. 4MR Park Tree Mulching & Clean-up: Tuesday, November 11th! Bring work gloves and what ever shovels and rakes you have handy to Four Mile Run Park on the morning of Veterans Day. We're prepping over a dozen newly planted trees for winter. (Please RSVP to the 4MR Park Event on Facebook or at the email above to help us prepare). 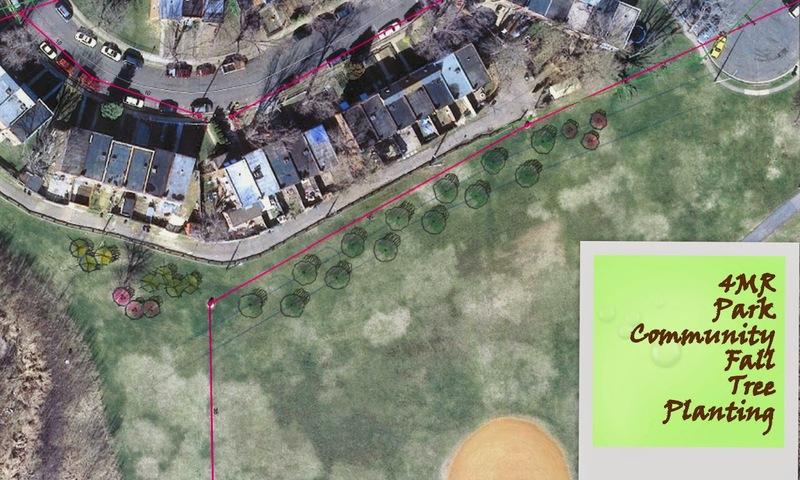 Over the past summer, in conjunction with the citizen-run Four Mile Run Farmers & Artisans Market, the City of Alexandria launched its first-ever crowdfunding campaign to raise funds to kick-start the recently adopted Four Mile Run Park Improvement Plan by planting new trees in the park. Citizens responded with contributions large and small by donating tax-deductibly via the crowd-funding website. With the arrival of tree planting season, over a dozen new trees were planted Thursday in the portion of Four Mile Run Park along the Mark Drive alleyway. A community mulching and park cleaning day is planned for the morning of Veterans Day, November 11th at 9am to prepare the trees for winter. 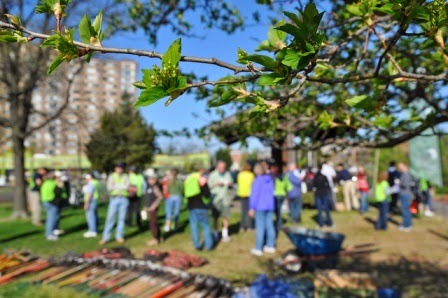 The 4MR Park Community Fall Tree Planting is a community initiative together with the City of Alexandria's Department of Recreation, Parks and Cultural Activities and funded in part by the Four Mile Run Farmers & Artisans Market and Action Alexandria who each awarded $1,000 to the project. Citizens contributed another $1,000 that the City was able to further combine with tree donations from other sources in order to advance the project. The 4MR Park Tree Planting is a continuation of the work begun over the last few years by a group of community volunteers in the Arlandria neighborhood who came together to perform various improvement projects in and around Four Mile Run Park to complement the work of the Four Mile Run Restoration Plan and the new Four Mile Run Park Improvement Plan. 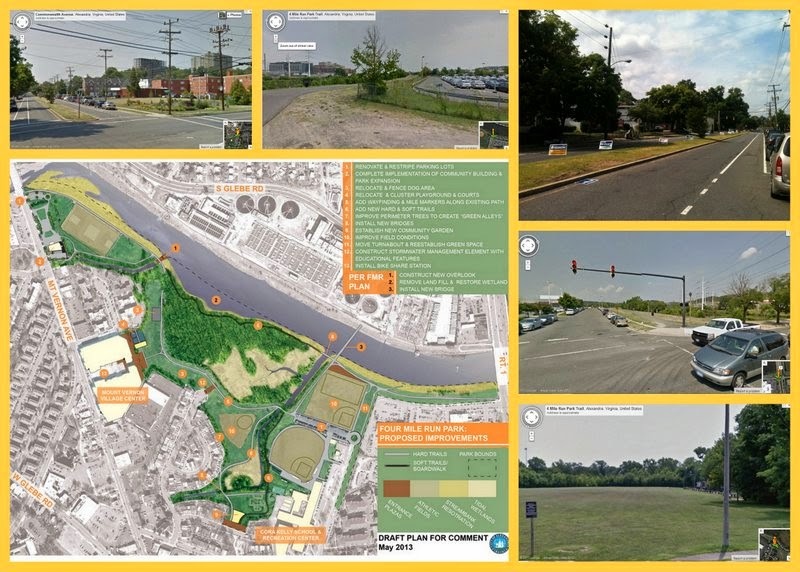 The projects include: the Four Mile Run Farmers & Artisans Market, the Four Mile Run Park Expansion, Commonwealth Park (the rehabilitation of a former electrical substation at 3550 Commonwealth Avenue) and a large tree planting last fall. All of these activities have been documented here on The Arlandrian (www.arlandria.org). The St. Rita 5k Tomorrow Morning!! The St. Rita 5k is SaturdayMorning!! 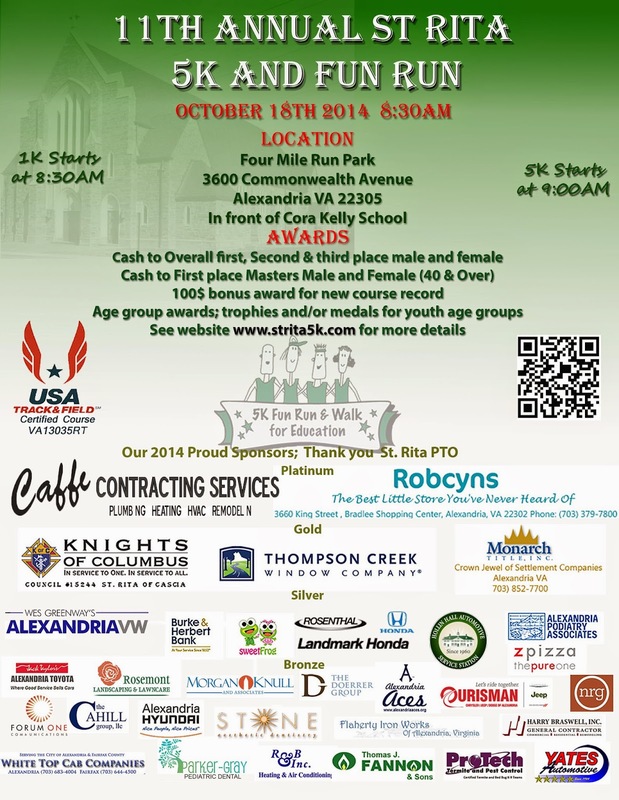 St Rita's Catholic Church on Russel Road in Arlandria hosts its 11th Annual 5k and Fun Run on October 18th at 8:30am. In addition to some sweet cash awards for top three men and women and top masters man and woman, race organizers are also giving away age group awards of gift certificates to area restaurants and businesses: some great places in Del Ray and Old Town and Z Pizza locations in Springfield, Arlington, Alexandria, Lorton and Falls Church, Pacers too. PLUS some really nice awards for the children. AND our race bags are awesome. Coupons for free food at area restaurants, Uber credits, coupons for savings from local businesses, water bottles, etc!! You can register at www.strita5k.com. See below about temporary road closures to accommodate the runners! PLACE: The race starts and ends at Cora Kelly School, 3600 Commonwealth Avenue. North end of Commonwealth Avenue from Frank Mann Field to the Four Mile Run Trail. Right-hand lane of Mount Vernon Avenue from Four Mile Road to South Glebe Road. The Alexandria Four Mile Run Park Bike Trail will be closed to cyclist from Route 1 to Mount Vernon Avenue on the Alexandria side of the trail from 9 am to 11 am. It will be open to pedestrians. There will be a children’s fun after the beginning of the competitive race, so bring your kids! Call Lisa McNichols at 703-549-1104 or Jude Prabaharan at (703)864-9883 or email Lisa at lisadonofrio@hotmail.com or Jude at jprabaharan@gmail.com, with any questions. The St. Rita 5k is this coming Saturday!! The Interactive Crowdsourcing Wikimap allows you to provide input to the City about walking and bicycling routes and concerns, by adding comments, points, line and photos. The online survey is designed to help the project team develop recommendations for how the City can improve the environment for walking and biking. The City of Alexandria Department of Transportation & Environmental Services is currently conducting the Pedestrian and Bicycle Master Plan, and is conducting a number of public engagement activities over the Summer/Fall. As part of the Pedestrian and Bicycle Master Plan Update, the City is seeking community input on existing walking and bicycle issues and needs, and ideas for improving the environment for walking and biking. 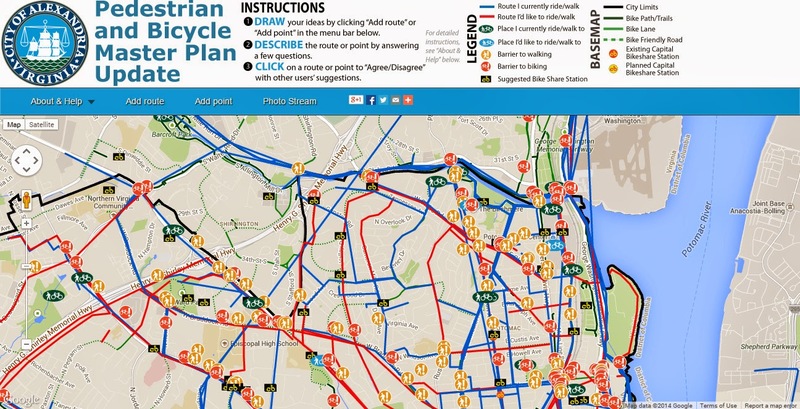 An online survey and interactive map can be accessed from the project webpage www.alexandriava.gov/pedbikeplan. The FY 2014 Interdepartmental Work Program approved by City Council on May 29, 2013 identified the Pedestrian and Bicycle Master Plan update as a planning effort to begin in FY 2014. The City’s 2008 Transportation Master Plan envisions a transportation system that encourages the use of alternative modes of transportation, reduces dependence on the automobile, and promotes a balance between travel efficiency and quality of life. The City’s Pedestrian and Bicycle Mobility Plan, also completed in 2008, is a supporting technical document to the Transportation Master Plan that provides additional planning guidance for pedestrian and bicycle projects. 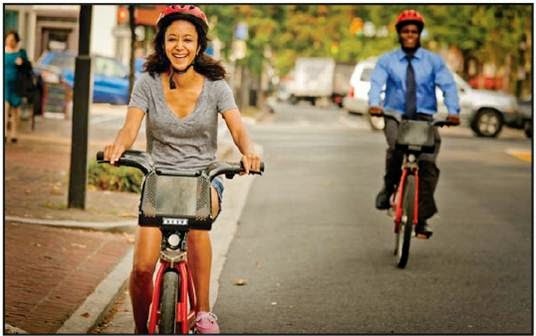 Since then, the City has adopted a Complete Streets Policy leading to the implementation of a number of pedestrian and bicycle improvement projects, and initiated the Capital Bikeshare program, both of which continue to expand citywide. The City is updating the Pedestrian and Bicycle chapters of the Transportation Master Plan to reflect changes that have occurred since 2008, including the Complete Streets policy, Capital Bikeshare program, and a move toward implementing on-street bicycle facilities. In addition, the City will be developing a Complete Streets Design Guidelines Manual. The update of the Pedestrian and Bicycle Master Plan will include an evaluation of existing conditions, issues, constraints and needs, as well as a review of existing policies, goals and objectives. Both a pedestrian and bicycle network will be developed to identify short and long term projects, future bikeshare station locations, and actions and strategies to implement the plan. The update will be reflected in new pedestrian and bicycle chapters in the City’s Transportation Master Plan, and will include a separate technical appendix. Both the chapter updates and technical appendix will serve as an update to both the Transportation Master Plan chapters, and the 2008 Pedestrian and Bicycle Mobility Plan. The City of Alexandria is committed to compliance with the Americans with Disabilities Act, as amended. To request a reasonable accommodation, e-mail Geralyn.Taylor@alexandriava.gov or call 703.746.4084, Virginia Relay 711. For more information, visit alexandriava.gov/PedBikePlan or contact Steve Sindiong, Principal Transportation Planner at Steve.Sindiong@alexandriava.gov or 703.746.4047. Much of the discussion about a new proposal from Dominion Power has focused on deciding along which route they will run the new high-voltage power lines across Alexandria to Arlington, but a lesser discussed aspect of the proposal involves what will happen at the substations at either end of the new lines. Along the George Washington Memorial Parkway, Dominion and its partner Pepco envision enlarging the existing substation on the former GenOn power plant. While they don't expect to expand the property, the substation itself would expand within the existing property and take up much of its space, bringing it closer to the park's roadway. Work at Dominion’s Glebe Substation will require construction inside an expanded footprint to accommodate a new line and new equipment to support reliability needs to local residents and businesses. Dominion is offering the chance for the public to engage with them regarding the proposal. They are hosting an informational open house to learn more about proposed plans to add a new 230kV electric transmission line between its Glebe Substation, located at the intersection of S. Glebe Road and S. Eads Street in Arlington County, and Pepco’s Potomac River Substation at the intersection of Slaters Lane and E. Abingdon Drive in the City of Alexandria. 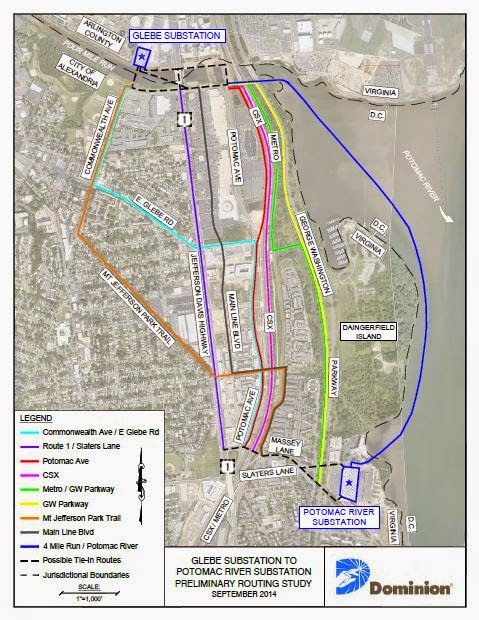 Late last Spring, Dominion Virginia Power has approached the City of Alexandria regarding Dominion’s proposal to construct a new 230-kilovolt underground transmission line between Alexandria and Arlington in the vicinity of Jefferson Davis Highway and Potomac Yard. The project enlarge and upgrade equipment at the existing switching station on E. Abingdon Drive in Alexandria, and connect it to the Glebe Substation on S. Glebe Road in Arlington. On September 11th, the City's newly formed Underground Transmission Line and Substation Working Group held its first meeting to examine the effects of the proposal. Dominion Virginia Power identified nine preliminary alignments for the new transmission line connecting these two substations. Dominion indicated that they intend to file with the State Corporation Commission by the end of November for the project. 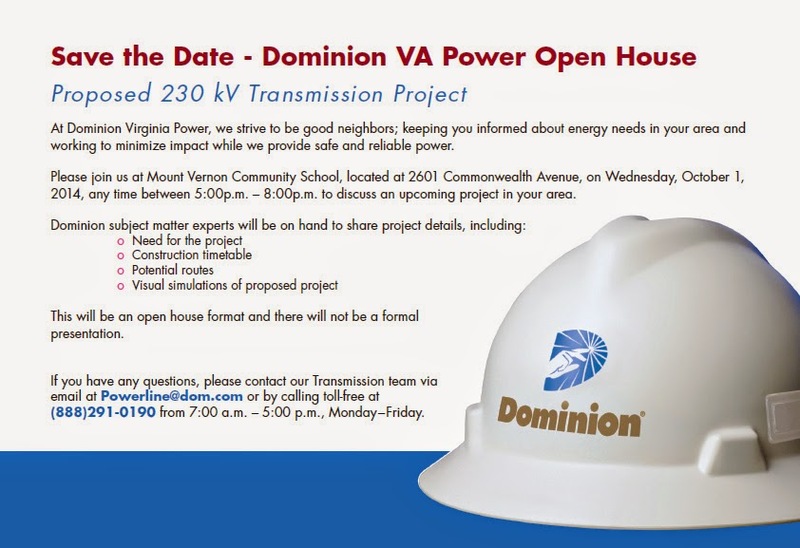 Dominion Virginia Power will hold a public information meeting on Wednesday, October 1st from 5-8pm at the Mount Vernon School (Community Room) located at 2601 Commonwealth Ave.
Dominion Virginia Power Proposed Transmission Line Project. Or check out the Dominion Virginia Power 230KV Line Project website. Dominion Virginia Power has approached the City of Alexandria regarding Dominion’s proposal to construct a new 230-kilovolt underground transmission line between Alexandria and Arlington in the vicinity of Jefferson Davis Highway and Potomac Yard. The project enlarge and upgrade equipment at the existing switching station on E. Abingdon Drive in Alexandria, and connect it to the Glebe Substation on S. Glebe Road in Arlington. City of Alexandria to host 3rd Annual Alexandria Multicultural Fest on Saturday, September 13 from noon to 4 p.m. at the Conservatory Center at Four Mile Run, 4109 Mt. Vernon Ave. Admission is free. 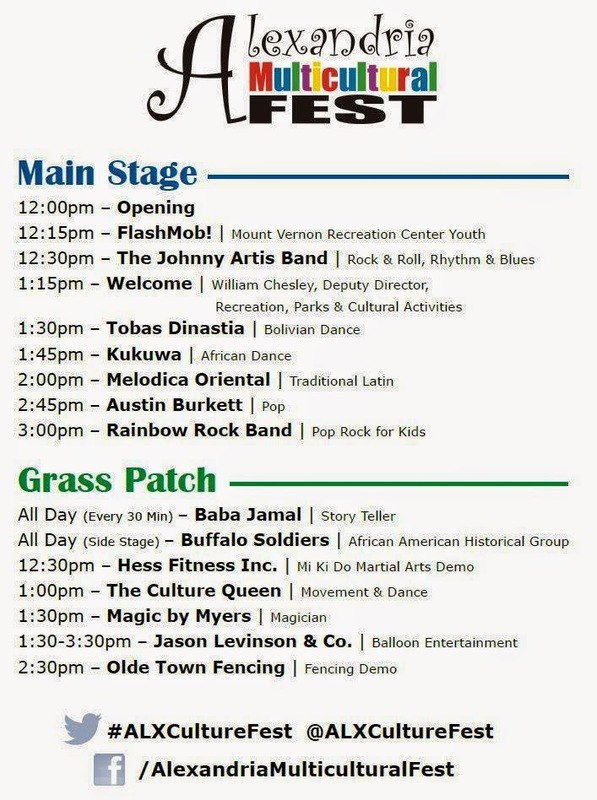 Designed to bring community members together to celebrate Alexandria’s diversity, the Alexandria Multicultural Fest features entertainment for all ages including live music and activities representing the region’s cultures. Performances include music from “Rainbow Rock Band,” “The Johnny Artis Band” and “Melodica Oriental,” as well as a variety of dance styles. Free games, demonstrations and activities will highlight a broad range of cultures and a wide variety of crafts and cuisines will be available for purchase. “Rainbow Rock Band,” featuring Kate Moran as the Rainbow Lady, will perform interactive Pop Rock children’s songs where kids can play instruments along with the band. “The Johnny Artis Band” has been entertaining the Mid-Atlantic region for years with their fun loving brand of Rhythm and Blues music. El Salvadoran and Honduran musicians form the group “Melodica Oriental” and perform in the traditional Latino style. For more information, visit www.alexandriava.gov/Recreation, or contact Kelly Gilfillen, Marketing Manager, at 703.746.4644 or Kelly.Gilfillen@alexandriava.gov. 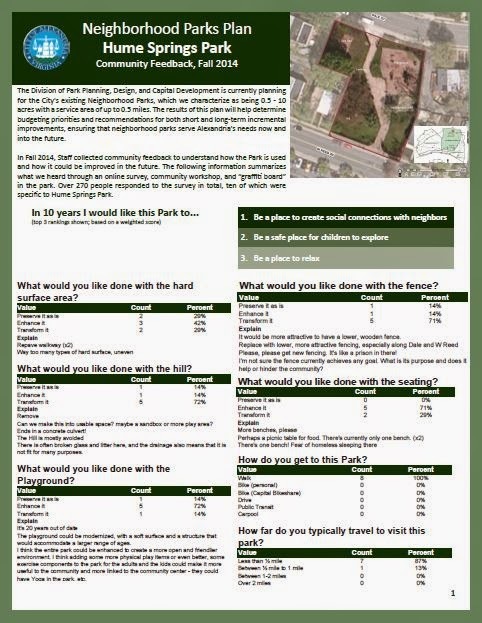 The survey and map are available in English and Spanish and will be available for input through early October 2014. In addition, the project will host a public meeting on September 30 from 7pm to 9pm at the Minnie Howard School Library, 3801 W. Braddock Road. HUGE Book Sale for Scholarship Fund of Alexandria! 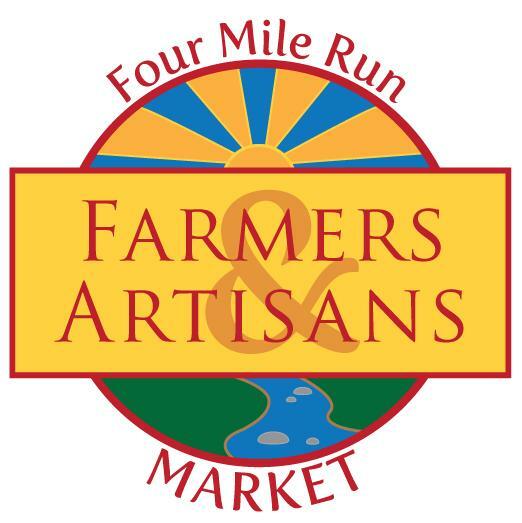 Come to the Four Mile Run Farmers & Artisans Market (www.4MRMarket.org) at 4109 Mt. 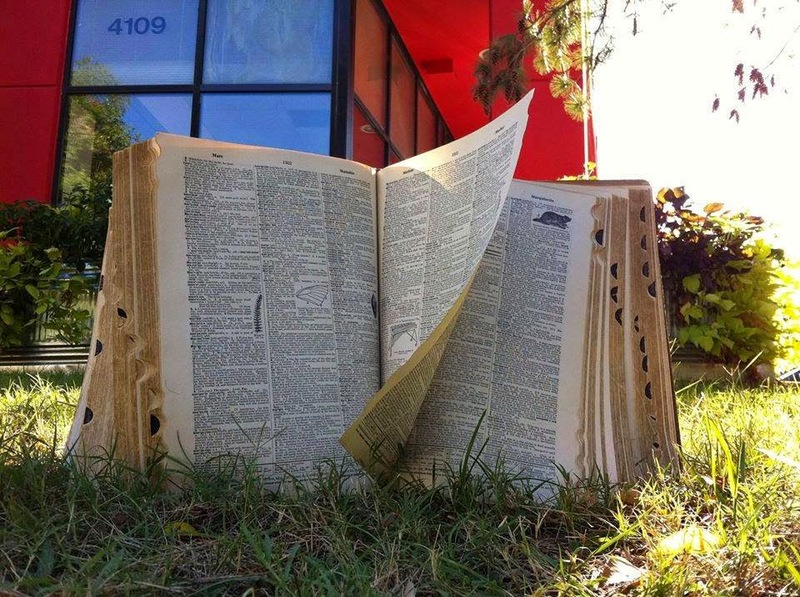 Vernon Avenue this Sunday September 7th to find that great read you've been looking for. Kidically Arlandria: Kidical Mass Alexandria joins the party! Check out this fun Arlandria event planned for Sunday, July 20th. Any kid who shows up with a bike at 4MRMarket on Sunday morning on the way to the Kidical Mass ride (just a short trip away via the Four Mile Run Trail) can be entered into drawing for either a $5 4MRMarket Token or a 4MRMarket t-shirt (sizes limited). Conveniently, for those who arrive by around 10am, Alexandria's own Ella Sophia will be performing on the 4MR Stage. The Four Mile Run Farmers & Artisans Market is open every Sunday from 9am-1pm from April til November at 4109 Mt Vernon Avenue. 4MRMarket is accessible via the Four Mile Run trails. Bike (and car) parking is available. The market is also served by the 10A & 10B MetroBuses (and they have bike racks too). It's time to explore and expand and to welcome Kidical Mass Alexandria to the family biking party! Our next ride with be joint with our neighbors to the South, on their inaugural ride. Route: http://ridewithgps.com/routes/5134414 - through Alexandria! We start off in Arlington, at the playground behind the Eclipse, Potomac Yards (it's the building with the Harris Teeter at Route 1 and South Glebe Road). Some folks will pre-stage at Four Mile Run Market but then we'll meet at 11am (we roll out about 15 minutes late, to give kids some time to play, put on sunscreen, etc) and roll down through the exploding retail of Potomac Yards, then around the leafy neighborhoods of Del Ray. After passing some great parks and exploring some fun trails, we'll roll back into Arlington and back to the playground. Those who want to continue on can join us in Crystal City for some yummy We the Pizza (we should get there around noon, in case you'd like to have others meet us there). All are welcome. This route will be about 4 miles, and flat as a pancake. It's always exciting when a family grows, and we are so happy to welcome Kidical Mass Alexandria to the extended family!